Growing healthy forests means using science to understand the needs of trees, bugs, fungi, fire, water, and more. The Washignton State Department of Natural Resources develops information about all the types of forests that we manage—from rainforests on the Olympic Peninsula, to moderate Puget lowlands, to the pine-dominated forests of Central and Eastern Washington. Our scientists carry out research and monitoring that DNR uses to make science-based decisions about its forest management practices. DNR's Forest Health Program works with federal and other partners to provide technical assistance about tree and forest health care to all types of public and private landowners. Whether you are interested in healthy tree growth, diseases or pests that affect trees, or in how to create older forest conditions next to streams, lakes, and rivers, DNR can assist. 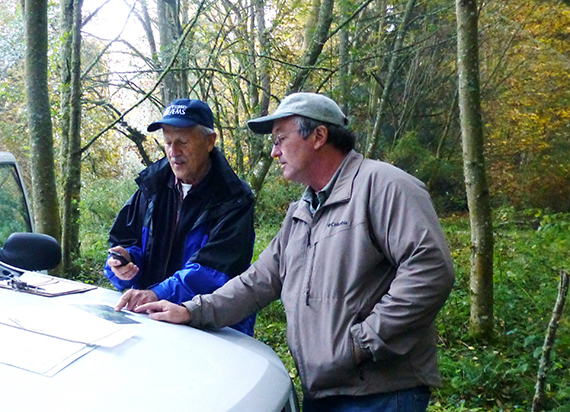 Forest Health Program entomologists and pathologists provide technical assistance and recommendations on tree and forest health care for state and private forest lands throughout Washington. We assist forest landowners and land managers with: identifying present or future forest insect and disease issues, as well as other adverse environmental problems such as drought, wind damage, or winter damage; pest prevention and suppression activities such as slash disposal, blowdown salvage, sanitation salvage, thinning methods, planting recommendations and pheromone and pesticide applications; pesticide use and hazard tree evaluations; providing input into the development of forest management prescriptions that reduce the risk of forest stands from insects and disease; field and classroom training for professional foresters, forest landowners and school children regarding forest insect and disease identification, issues, conditions and management techniques. Do you know what your properties wildfire risk is? If you would like to find out, please click here. If you need assistance with any of these issues, please give us a call at 360-902-1300 or email forest_health@dnr.wa.gov. Firewise USA ®: Administered through the National Fire Protection Association, the Firewise USA ®program works with local fire districts, conservation districts, counties, and extension programs to help homeowners and communities to prepare for wildfire. Forest Health Hazard Warning: Former Washington Commissioner of Public Lands Peter Goldmark issued a Forest Health Hazard Warning for portions of Ferry, Klickitat, Okanogan, and Yakima counties under the authority of Washington State Law RCW76.06 to notify residents of forest threats and prompt action to mitigate those risks. Forest Stewardship Program: The Forest Stewardship Program provides land management advice and assistance to forest owners. The program helps assess resource conditions and forest health, identify problems and opportunities, and identify management practices to achieve objectives. The program is administered by the Small Forest Landowner Office. Urban and Community Forestry Program: The Urban and Community Forestry Program provides technical, educational and financial assistance to Washington’s cities and towns, counties, tribal governments, non-profit organizations, and educational institutions. The UCF program seeks to educate citizens and decision-makers about the economic, environmental, social and aesthetic benefits that healthy community trees provide. The program's mission is to help communities develop self-sustaining urban forestry programs that enhance the health and functionality of urban trees and forests to maximize those benefits. Cost-Share Programs: Information and applications for DNR-administered cost share programs to reduce wildfire risk can also be found on the Forest Stewardship Program site. Other programs through the Forest Stewardship Program are available to provide assistance with activities such as stewardship plan creation and implementing conservation practices. Washington State University Extension: Washington State University Extension Forestry provides education and information about forest management to forest owners. The extension offers classes, workshops, field days, and publications. Additional forestry resources – such as coached planning sessions, publications, and videos – can be found on the WSU Extension website. Our trees and forests are subject to a wide variety of pests and diseases, which are usually caused by bacteria, viruses, and most commonly, fungi. Tree diseases can decay wood, decrease tree growth and cause tree mortality in both forested and urban environments. Overall, forest diseases can impact carbon sequestration, purification of water, reduction of flood risk and cultural and recreational values. Many of our diseases in Washington are native and have been here a long time, often directly influencing the biodiversity and nutrient cycling in forests. All parts of a tree, including roots, stems, branches, and foliage, can be infected by the different organisms that cause diseases, resulting in different impacts on a tree’s health. They often have specific host preferences and environmental conditions in which they live, reproduce and spread. Non-native and invasive diseases are a constant threat to our forests since our trees have no natural defenses against the pathogens. Information about specific diseases and projects we are working on can be found below. If you have questions about tree diseases or other forest health questions, including management and treatment options, please contact our State Forest Pathologist, Dan Omdal, at 360-902-1692 or email dan.omdal@dnr.wa.gov. DNR’s forest entomologists provide technical assistance to private landowners and state land managers with identification and management of forest insect pests. The primary focus is on insects that cause mortality such as bark beetles, those that cause growth loss and stress such as defoliators, and those that affect wood quality. 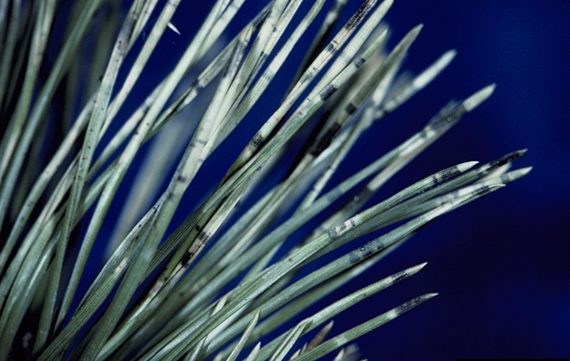 We emphasize integrated forest pest management methods that focus on increasing stand resistance to insect attack and resilience following any damage that may occur. Management strategies that can increase resistance and resilience include increasing vigor of leave trees through selective thinning, reducing the proportion susceptible hosts, altering stand structure and/or age classes, planting species appropriate for the site, and reducing available breeding material (slash management or salvage following storms and fires). 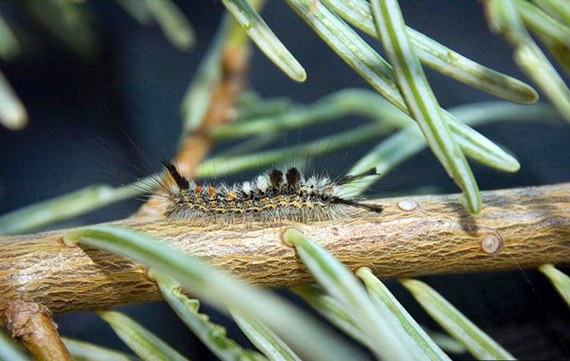 We annually monitor populations of Douglas-fir tussock moth and western spruce budworm in eastern Washington. We assist with the annual aerial survey. When unexpected levels of damage occur, we may conduct special monitoring projects to determine levels of mortality and potential causes. We also provide assistance to state and private land managers with specific insect monitoring, stand evaluations, and suppression projects. In some stands where forest health treatments have been applied, we install long-term plots to monitor changes in insect activity. If you have questions about forest insects in Washington, please contact our State Forest Entomologist, Glenn Kohler, at 360-902-1342 or email glenn.kohler@dnr.wa.gov. If climate change results in more frequent and intense droughts we can expect to see more mortality from insect outbreaks and root diseases due to increased tree stress. However, these pests will still require their range of suitable hosts to maintain outbreaks. In a warmer climate, insects can reduce their development time. For some bark beetle species, this may shorten the length of generation time or allow them to occupy ranges farther north in latitude or at higher elevations. In recent years, mountain pine beetle has been documented killing pines outside of its historic range in northern Canada. For some defoliators, the outcome of shorter development time may be more uncertain because they rely heavily on synchrony in time with their hosts. Unseasonable extremes in temperatures can effect forest insects, but in various ways. Warmer winters could lead to greater survival of some bark beetles, with the greatest effect at higher latitudes and elevations where extreme cold has excluded them in the past. Early spring warmups could influence some insects to emerge out of synchrony with their hosts or expose larval stage defoliators to late freeze events. Sustained temperatures above or below an insect’s developmental thresholds may slow activity and delay development, possibly exposing them to natural controls longer. For landowners and land managers it is challenging to know how to adapt to coming climate changes that are uncertain. In a changing climate it is more important than ever that DNR encourage and educate landowners to improve stand resistance to forest pests and resilience to recover from damage. Stand resistance and resilience can be increased by doing activities that increase tree vigor, reduce competition, increase species diversity and retain or plant species best adapted to the site. Our number one forest health strategy for eastern Washington forests is to reduce stocking to site appropriate levels and foster site appropriate species composition so the forests will be better adapted to the current climate. This is also our best statewide forest health climate change adaptation strategy as drought conditions are expected to worsen over the coming decades thereby reducing the tree carrying capacity of many sites. If you have questions about climate change and forest health, please contact us at 360-902-1300 or email forest_health@dnr.wa.gov. Fire is a natural process that many ecosystems depend upon to maintain their structure and function. Although it is difficult not to think of fire from a destructive point of view, it is in fact a natural process of renewal, and a catalyst for promoting biological diversity and healthy ecosystems. Some plant species are actually adapted to fire. For instance, lodgepole pine (Pinus contorta var. latifolia) have serotinous cones that are retained in the tree canopy for long periods of time. When a fire burns through a lodgepole pine stand, thousands of seeds are released as the resin seal that encloses the cones melts thereby allowing it to reproduce prolifically following a fire. The Pacific Northwest is characterized by a diversity of vegetation types and fire regimes that range from frequent surface fires to infrequent high-severity fires. Historically, dry forests of the PNW experienced low severity, frequent fires that eliminated fuel ladders, elevated tree crown bases and reduced competition for site resources among surviving trees and other plants. This resulted in forests dominated by large, widely spaced, fire-tolerant ponderosa pine with little accumulation of coarse woody debris on the forest floor. Wildfire size, severity, and frequency have been increasing, particularly in the lower elevation dry forest types. 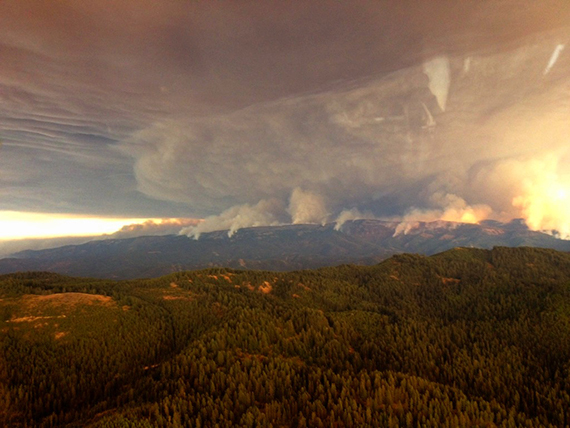 This is mainly due to past and present fire suppression efforts. Fire suppression in these forests has resulted in heavy fuel loads, species composition shifts, smaller than average tree size and multi-layered canopies that act as fuel ladders. 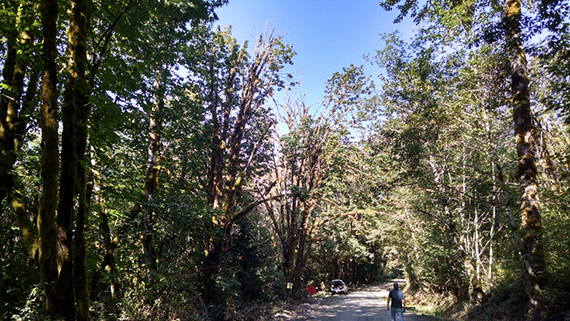 If you have questions about fire and forest health, please contact us at 360-902-1300 or forest_health@dnr.wa.gov. Over the last several years DNR has taken an active leadership role to increase the pace and scale of forest restoration across all lands in eastern Washington to improve forest health and protect communities. Forest health program staff have played a critical role in collaborating with partners to increase the pace and scale of restoration. DNR participates in the Tapash Sustainable Forest Collaborative and the North Central Washington Forest Health Collaborative. The Forest Health staff have led many agency efforts over the last several years designed to increase the pace and scale of forest health restoration including: the state’s first Forest Health Hazard Warning issued by the Commissioner of Public Lands in 2012; a 2014 Forest Health Report to the Washington Legislature which characterized the scope of eastern Washington Forest Health issues and strategies to create resilient forests; and provided leadership with partners to obtain millions of dollars to treat thousands of acres in and adjacent to the Colville National Forest and Okanogan-Wenatchee National Forest through the Joint Chiefs Landscape Restoration Partnership. 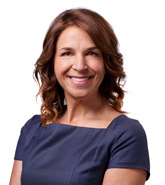 In March 2017, Commissioner of Public Lands Hilary Franz signed an historic agreement with the U.S. Forest Service to provide a new tool in the forest restoration effort, known as the Good Neighbor Authorityor GNA. The GNA allows the state to partner with the Forest Service under an agreement that allows DNR to conduct forest, watershed, and rangeland restoration services on federal ground as Agents of the federal government. Learn more about the GNAin Washington here. If you have questions about the DNR’s Forest Health Restoration projects, please contact us at 360-902-1300 or email forest_health@dnr.wa.gov. For over a decade, the Department of Natural Resources (DNR) has been actively and successfully working to restore the health and resiliency of forests on State Lands in eastern Washington. Despite these efforts, many thousands of acres of forests remain at risk from wildfire, insects and disease. In 2017, the Washington State Legislature passed a new law, Chapter 248, Laws of 2017 (E2SHB 1711), which provides DNR with new tools and increased flexibility to address the growing forest health problem. The new law clarifies DNR’s roles and obligations in addressing forest health concerns on eastern forested State Lands as part of its role within the larger context of the 20-Year Forest Health Strategic Plan. As a result, the DNR has developed a Strategy to Restore Forest Health on State Lands in Eastern Washington. The State Lands Strategy identifies key values, goals, and objectives that will guide DNR’s forest health program to success. This strategy will help inform operational and tactical decision-making through implementation and prioritization of forest health treatments on State Lands. The goal of this strategy is to create and maintain a landscape of healthy and resilient forested State Lands that supports the trust beneficiaries, the public, and a sustainable forest products market. Forest Biomass refers to by-products of forest management activities or forest health treatments prescribed under the State’s forest health law. Using forest biomass reduces the risk of forest fires, energy costs, carbon emissions that result from forest fires, dependence on foreign oil and the loss of forest resources to pest and diseases. DNR’s goal is to increase forest biomass utilization to improve forest health and reduce wildfire risks.Washington’s forests have an abundant renewable supply of woody biomass and many forests in eastern Washington need thinning to restore health stand conditions. However, many of the trees have no value in existing commercial markets because they are too small or the trees are too far from any forest products mills. Using some of this material for liquid transportation fuel, heating, electrical power and innovative forest products such as cross-laminated timber will play an important role in the State’s emerging green economy, forest health restoration and help address climate change. Serving on the advisory committee of the Northwest Advances Renewables Alliance (NARA), which completed a demonstration flight in November, 2016, with Alaska Airlines using jet fuel made from slash piles. Washington State Forest Biomass Coordination Group, coordinated by DNR, the Washington State Department of Commerce and the WSU Extension Energy Program, provides an opportunity for all stakeholders to collaborate, share information and provide guidance for forest biomass and wood energy efforts in the state. $1.35 million in grants from the USDA Forest Service have been given to DNR for work on wood energy and biomass utilization projects. If you have questions about DNR’s wood energy and biomass utilization projects, please contact Chuck Hersey at 360-902-1045 or email chuck.hersey@dnr.wa.gov. The Forest Health Highlights in Washington report is published annually by DNR’s Forest Health Program and the USDA Forest Service each spring. 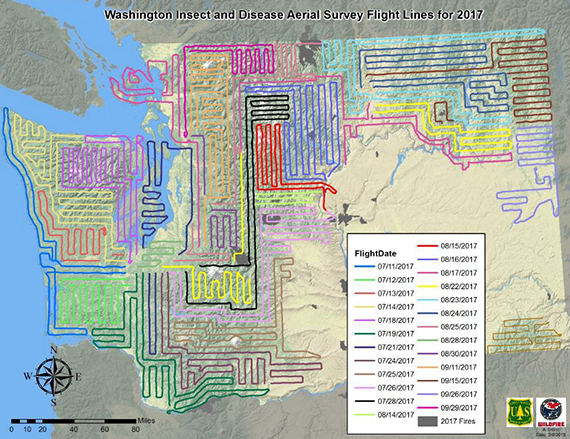 It summarizes the major forest insect and disease conditions from the previous year across all ownerships throughout Washington State. Much of what is reported are results of aerial surveys and ground based surveys, but it also includes information on special monitoring projects, suppression projects, and other forest-health related projects and initiatives. It also includes information on recent forest damaging weather events, droughts, and wildfires. Printed copies are available on request by contacting 360-902-1300 or forest_health@dnr.wa.gov. Systematic aerial surveys are conducted to collect and report on forest insects, diseases, and other disturbances across federal, state, tribal and private lands. These surveys have been conducted annually since 1947 in the Pacific Northwest by USDA Forest Service (USFS) with the cooperation of State and private partners since 1948. Aerial surveys have proven to be an efficient and economical way to detect and monitor forest change events over large forested areas. Statewide aerial surveys are conducted each year to assess forest health in Washington State. They capture mortality and discoloration caused by insects, diseases and abiotic disturbances. This relatively low cost remote sensing method gives a coarse, landscape-level overview of forest conditions. The data collected are then used with other remote sensing and ground sampling techniques to further enhance the data accuracy of significant forest health events and changes. The primary data collection method is known as aerial sketchmapping. Data are collected by specially trained aerial observers from the USFS and Washington Department of Natural Resources (DNR). The necessary components to make this survey happen are a high-winged aircraft that provides good visibility and can fly at relatively slow speeds between 1,000 to 2,000 feet above ground level, a safety conscious pilot, and an experienced sketchmapper who can identify forest damage observed on the ground and plot it on a map while moving in the air. Areas of forest damage are recorded as polygons using a Digital Aerial Sketchmapping System (DASM). The DASM uses a moving map display, GPS, and a touch screen to create a digital version of the data while in the aircraft. The polygons are coded with attributes such as tree species affected, number of trees (or trees per acre) affected, likely cause of damage, and severity of damage. This advanced digital sketchmapping system allows rapid summarization and near real time reporting of tree mortality and damage. This is an extremely valuable tool for forest managers and other clients who can use the data to make timely decisions and assessments. Watch this video showing how the DNR and USFS conduct an aerial survey to assess the forest health of Washington state. For more information on the aerial survey program, please contact Aleksandar Dozic at 360-902-1320 or email aleksandar.dozic@dnr.wa.gov. 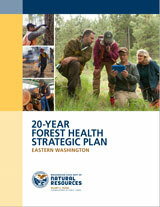 The Forest Health Highlights in Washington report is published annually by the Forest Health Program. It summarizes the major insect and disease activities in Washington State. An interactive web service for the Forest Health Aerial Survey data can be found here. This is the place where the most current Annual and Cumulative Aerial Survey data are displayed. Users can create their own PDF, JPG, and PNG maps of the field of view by clicking on the printer icon in the upper right corner. Note: The Cumulative Aerial Survey data set contains several million polygons, so to speed up the loading process, the user may want to zoom in until “15 Year Mortality Indicator 2001-2015” title on the left switches from grey to black.